Dwarf mondo grass is a wonderful easy-care plant to cover areas of the landscape where sun-loving lawn grasses won’t grow. Its grass-like leaves are dark green and grow in tight clusters. Slow growing, dwarf mondo sends out runners to form a dense, fluffy groundcover. At a mature height of less than 6-inches, dwarf mondo grass can be useful in many areas of the landscape. Amend soil with organic matter prior to planting to aid with moisture retention and drainage. 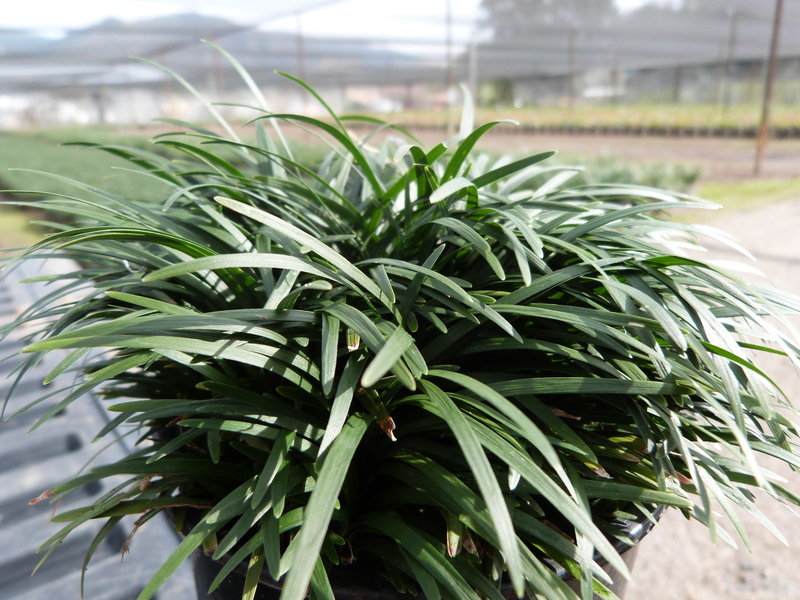 Once established dwarf mondo grass needs only moderate watering, but plants will grow and spread faster with consistent watering. Occasionally tips of foliage turn brown, due to dry conditions, otherwise plants are generally care free and not affected by pests or disease. With only one main flush of growth in spring, mowing or trimming plants down in spring and summer can ruin the appearance of the leaves for a long period. Mow, or in small areas, trim back only in late winter to remove brown leaves just before the new growth begins. Excellent for use as an edging plant, as a lawn substitute in shade, or a low ground cover in a natural pattern or a modern grid. Also works well between stepping stones or at the feet of other plants or trees in containers.